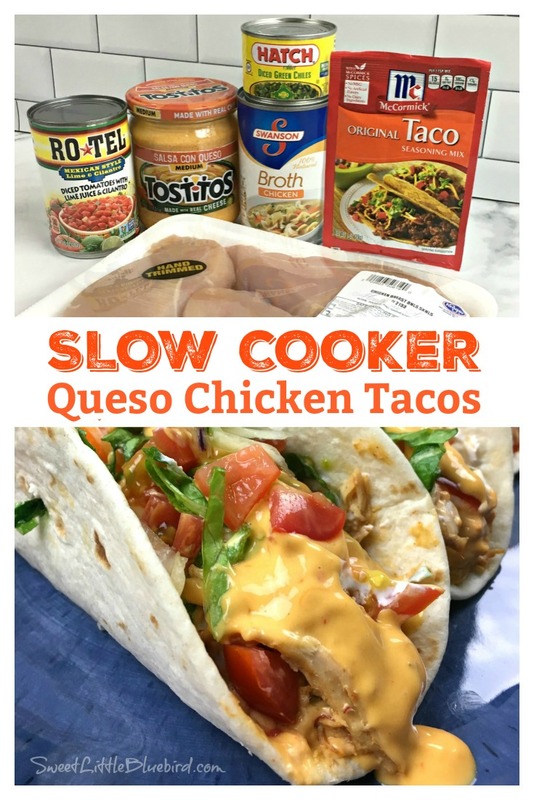 Todays’ recipe is a tasty twist for one of my most popular slow cooker recipes – Slow Cooker Queso Chicken Tacos! 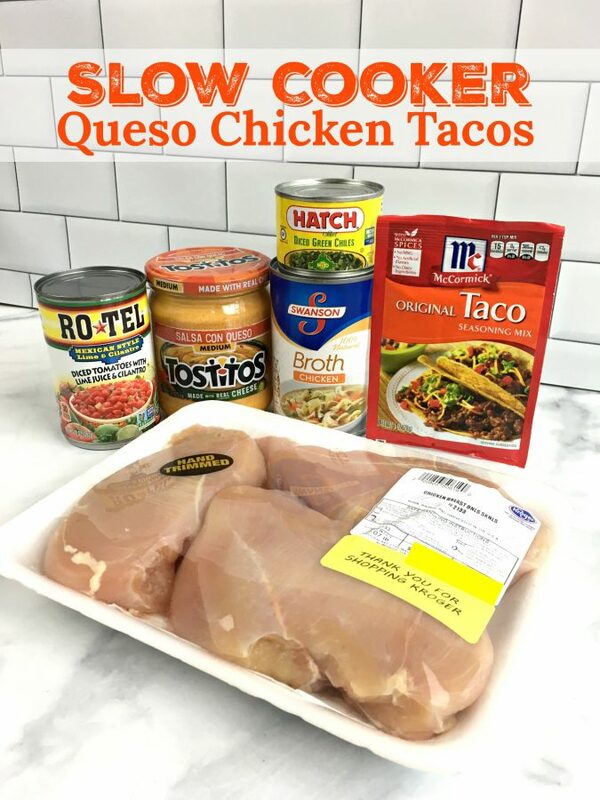 SLOW COOKER QUESO CHICKEN TACOS – Taco night just got a lot more flavorful with this SUPER EASY, delicious weeknight meal that makes the BEST chicken tacos! 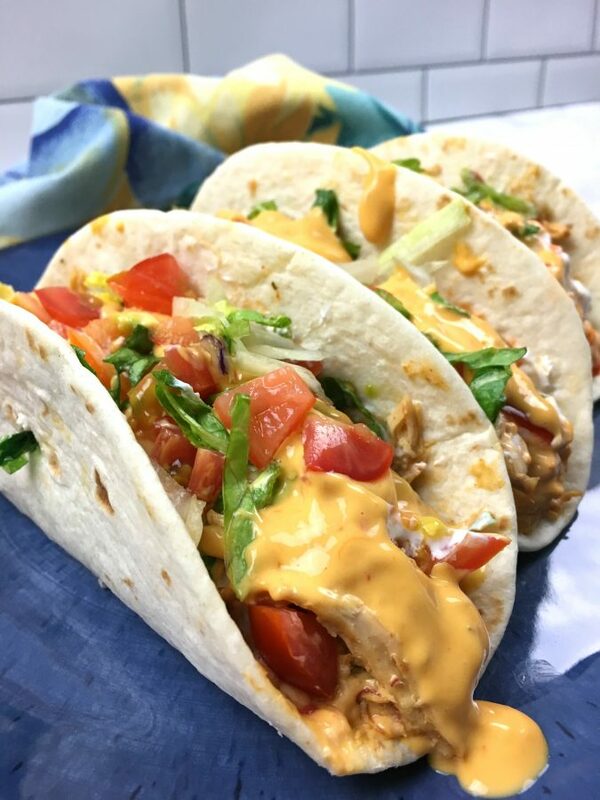 Only a few ingredients and minutes to throw together, these Queso Chicken Tacos are loaded with flavor and require little work and effort. Use the chicken for tacos, burritos, wraps and bowls. 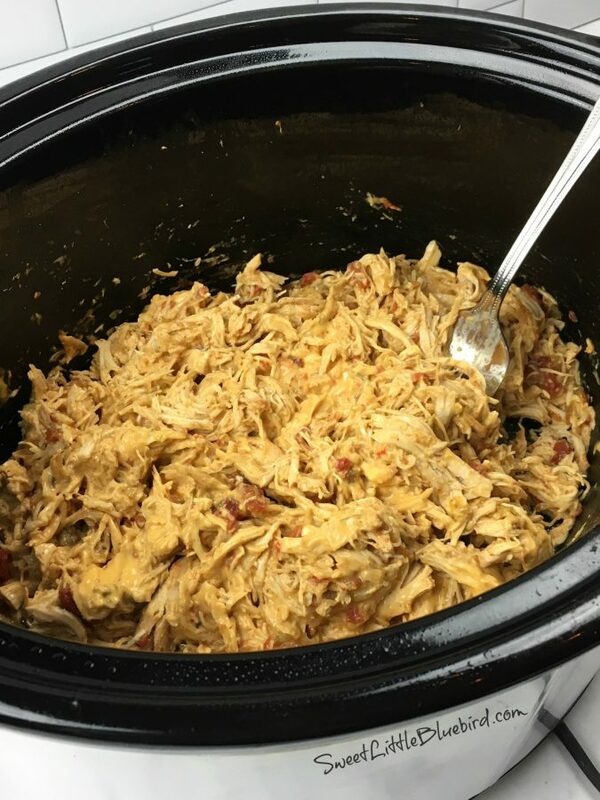 Perfect for feeding a crowd, parties and game day. 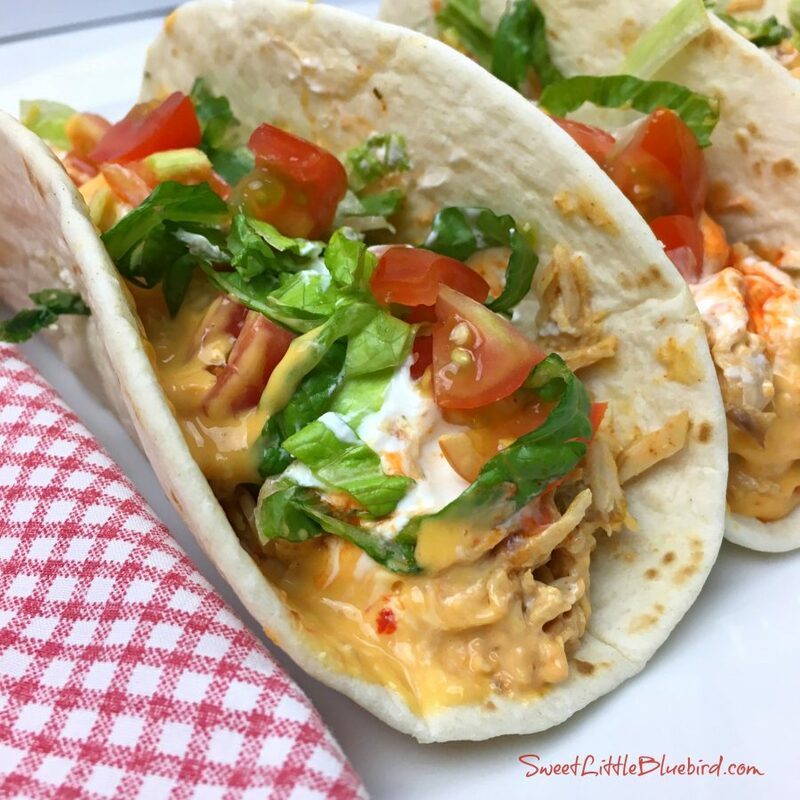 This recipe is slightly adapted from my popular Slow Cooker Shredded Chicken Tacos. The addition of green chiles and queso steps it up a notch and was a nice change. 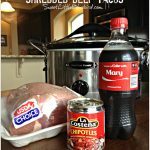 Boneless skinless chicken breasts, taco seasoning, chicken broth, rotel, green chiles, queso, taco shells and your favorite taco toppings. Lightly spray slow cooker with non-stick cooking spray. Place chicken in a single layer and sprinkle taco seasoning evenly on top. In a medium size bowl, add Rotel, green chiles and chicken broth, mix well and pour over chicken. 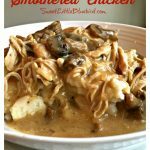 Cook on high for 4-6 hours (adjust cooking time according to how fast/slow your cooker cooks – for some cookers, chicken may be done in 3-4 hours on high). When ready, drain excess liquid leaving just a smidgen behind (I use a soup ladle), then shred chicken using two forks. Last, spoon queso on top and gently mix with chicken, coating chicken evenly. Cook on low for 20 minutes or until heated through. Serve favorite toppings, enjoy! 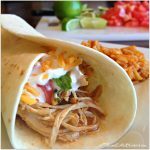 Chicken tacos are on regular rotation in my home, when I served these tacos last week, my family absolutely loved them, giving dinner two big thumbs up! They kept going back for more, leaving the cooker empty with no leftovers. An empty pot is always a good sign for a winning recipe! 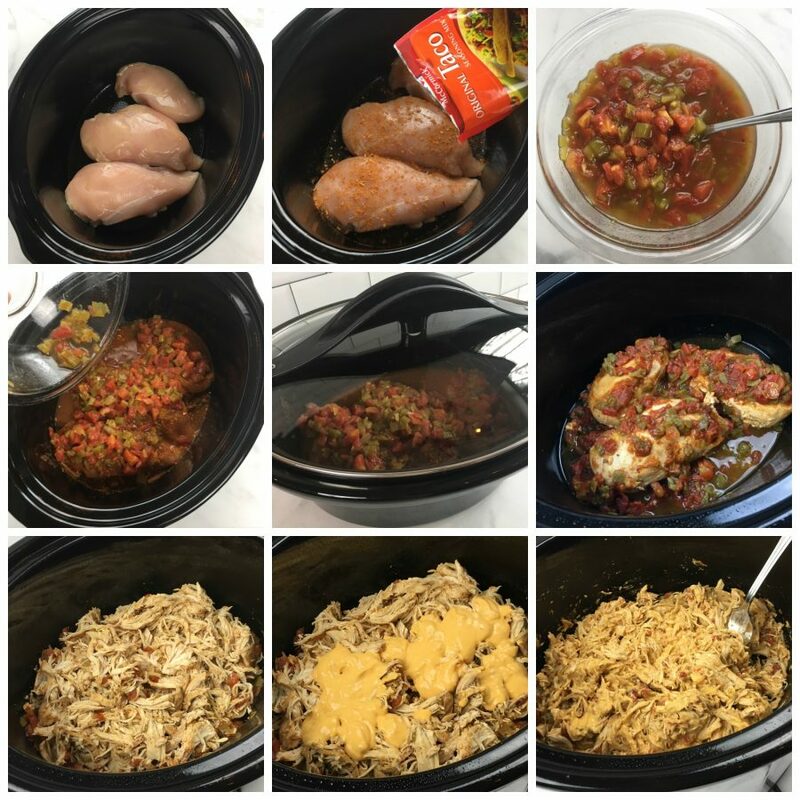 Lightly spray slow-cooker with non-stick cooking spray. Place chicken in single layer and sprinkle chicken evenly with taco seasoning. In a medium size bowl add Rotel, green chiles and chicken broth and mix well. Pour evenly over chicken. Cook on low for *6 to 8 hours, or on high for *4 to 6 hours. Cooking times may vary depending on your slow cooker, adjust accordingly. When ready, drain excess liquids leaving just a smidgen behind (I use a soup ladle), then shred chicken using two forks. Last, spoon queso on top and gently mix with chicken, coating chicken evenly. Cover and cook on low for 20 minutes or until heated through. Serve with tortillas (hard or soft shell) and your favorite taco toppings. Enjoy! Use the chicken for tacos, burritos, bowls and wraps. I purchased a jar of queso and used the leftover as a topping and for tortilla chips. You can use original Rotel or Rotel hot – this recipe is super easy to adapt to your taste if you like things spicy/hot. What would you suggest for pressure cooker time? Any afjusments need to be made to ingredients? To make it vegetarian–do you think it would work with black beans instead of the chicken? Could you use velvetta instead of queso.. I have everything else just trying to adjust and not go to store! Yes – you can make your own queso with Velvetta, Tiffany. I added a link in the post. I just have a question, and it’s pretty lame: do you by any chance know the nutritional information for the finished chicken? 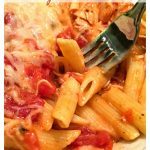 Looking for low carb and aside from the shell, this seems like it would be a good one! I love tacos any old way, but that drizzle of queso is really making me want these. Yummmmmm!